At the Asimenia Featham Schools of English, we believe that being proactive is key to preventing bullying from happening in schools and society and to this we attribute the success of our multi-award-winning and internationally-recognized Anti-Bullying Campaign, going strong since 2014. 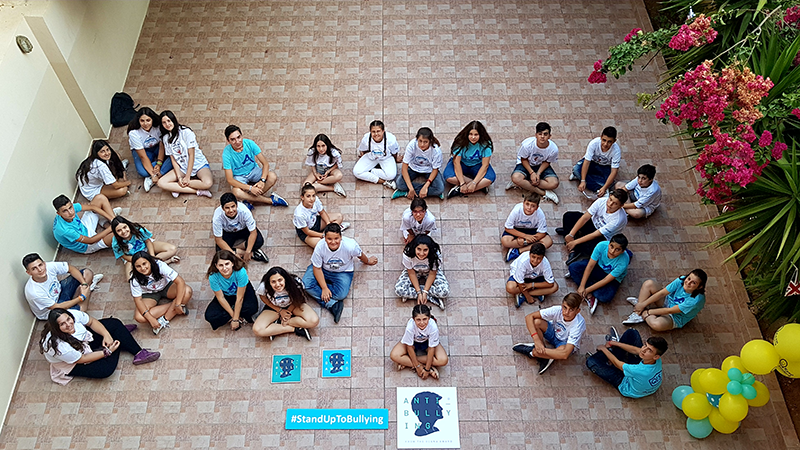 Our Anti-Bullying Campaign, the first ever by a Greek educational establishment, is spearheaded by our Diana Award trained Anti-Bullying Ambassadors & Volunteers Team which has honoured Stand Up To Bullying Day since it was first launched in 2016 by The Diana Award with the support of HRH The Duke of Cambridge. Even though we are based in Greece, on the beautiful island of Crete, as private English language schools we took the initiative to mark this day, as well as Anti-Bullying Week in the Autumn, in parallel with the UK. As I am writing this blog post, I am dismayed to see the headline on the front page of today’s local newspaper which states in bold that, according to a recent survey, “More than half of Greek schoolchildren are victims of verbal bullying”, yet another reminder that we need to continue the work we do. 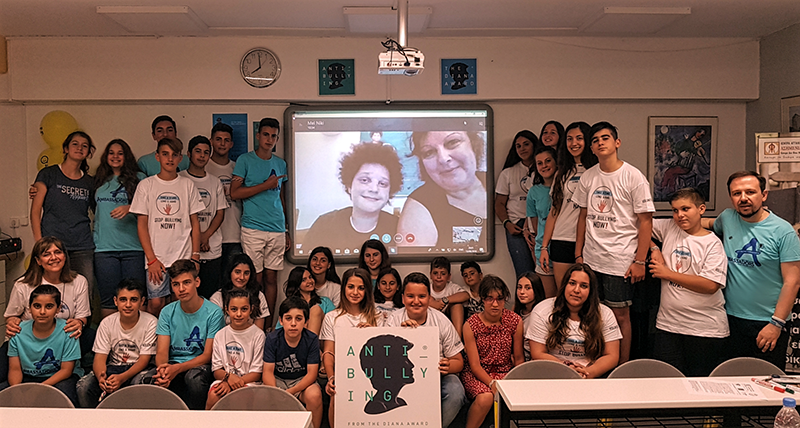 This year, our Stand Up To Bullying Day was very special as it included a Skype session featuring charismatic Diana Legacy Award holder Nicholas Nikiforou. Every day is Stand Up To Bullying Day for all who take this matter seriously, but having a special day to honour this cause once a year serves as a vital reminder of the importance of keeping alive the spirit of unity, kindness and social action in young people. In the days leading up to this day, we had made sure that everything was ready for another memorable Stand Up To Bullying Day. The bunch of balloons we ordered this year consisted of a trio of carefully chosen colours: blue representing The Diana Award charity, green for the Anti-Bullying Ambassadors Programme and yellow as a reminder to keep smiling. The official wristbands in support of this day had safely arrived from The Diana Award headquarters, colour print-outs had been made of this year’s “How I Stand Up To Bullying In 5 Words” worksheet, our Skype connection was clear and everything was set-up for an unforgettable outdoor movie night! The big day had arrived. Wednesday 13 June, was another hot, sunny day in our seaside town of Rethymno on the north coast of Crete. Our meeting was in the School Hall of our central school at 6pm, when the weather gradually starts to cool down. Thirty two members of our 50-strong Team showed up for an afternoon of wonderful Anti-Bullying activities. Those who unfortunately couldn’t make it because of end-of-year exams, had to stay at home to study. Our Diana Award-certified Anti-Bullying Ambassadors sported their blue branded T-shirts and our Volunteers wore their white T-shirt, designed by the Team itself, featuring the motto “Take A Stand, Lend A Hand” which sums up our Campaign pretty well. Since 2014, the Team has implemented a variety of innovative monthly Anti-Bullying projects including events, fund-raisers, art exhibits, journalism, competitions, surveys, sports days, crafts, music, theatre and dance. These young people have collected over 10 tons of goods accompanied by Anti-Bullying messages for crisis-stricken families registered with our Community Food Bank, have raised over €10.000 for charity, and have donated toys and books to refugee children stranded on our island. As leader of the team, I began the meeting by personally congratulating our 2018 Diana Award winners -all 29 of them! This year marks the second time our schools have received this honour. In 2016, we were the first educational establishment in Greece whose students won The Diana Award for Anti-Bullying Champion. At our schools, we always take every opportunity to make sure the children know well who Princess Diana was and why her monumental legacy of compassion, service and kindness will always serve as a beacon of humanity (e.g. in 2017, as part of our annual Anti-Bullying Christmas celebration, the Team put on a special tribute, in front of a total of 900 people, to commemorate the 20th anniversary year of the Princess’s loss). Therefore, a short biographical video (from The Diana Award YouTube channel) of the Princess followed so as to honour the person behind the award. It was very touching to see our Team’s young people break into spontaneous applause at the end of the video! Another round of applause followed when I proceeded to announce that next month we will welcome the inaugural Upskill Training to our schools, as well as the return of the Anti-Bullying Ambassadors Programme, both courtesy of the QLS network of language schools of which we are members. 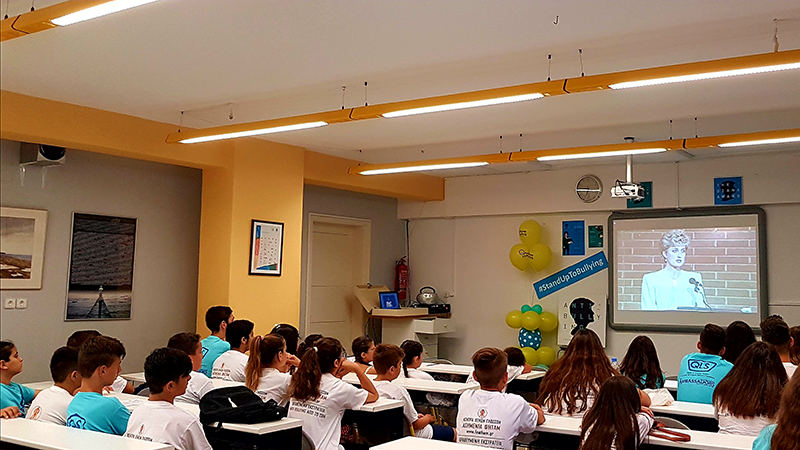 Last year alone, the first 120 Anti-Bullying Ambassadors in Greece were trained and certified by The Diana Award in collaboration with QLS. As soon as the students received their commemorative Stand Up To Bullying wristbands, we began our workshop session based on this year’s theme of “How I Stand Up To Bullying In 5 Words”. We brainstormed a wide variety of words and discussed how and to what extent each word was related to the theme. Vocabulary which stood out included, among others, the words “Kindness”, “Humanity”, “Equality”, “Offer”, “Support”, “Hope”, “Happiness” and “Freedom”. Once each student had completed their worksheet, they were photographed proudly holding it in front of the new Diana Award logo. An outdoor commemorative group photo session followed which involved the students forming the initials SUTB on the school’s premises! Last year, two of our students, both Anti-Bullying Ambassadors and Diana Award holders, were honoured to be among the 20 young people from around the world to receive invitations from TRHs The Duke of Cambridge & The Duke of Sussex, to the Inaugural Diana Legacy Award ceremony at St James’s Palace. One of the twenty young people to receive the Diana Legacy Award is Nick Nikiforou with whom we share the same dedication to Princess Diana’s vision of a better world by instilling the values of social action in young people. Nick, a multi-talented internationally-recognized face equality activist and Anti-Bullying Ambassador who is of British-Cypriot origin, was made honorary member of our Team in November 2017 and has since actively participated in many of our projects including Stand Up To Bullying Day 2018. During our Skype session, Nick, with his mother Melanie by his side, described how he came across The Diana Award, discussed his current volunteering projects in support of sick children and spoke about his recent exhilarating experience with The Diana Award’s “Be Nice” Bus. Finally, he talked in detail about how R. J. Palacio’s best-selling book “Wonder” relates closely to his own story and how he ended up being featured in The Diana Award insert of the UK DVD release of the critically-acclaimed film adaptation! 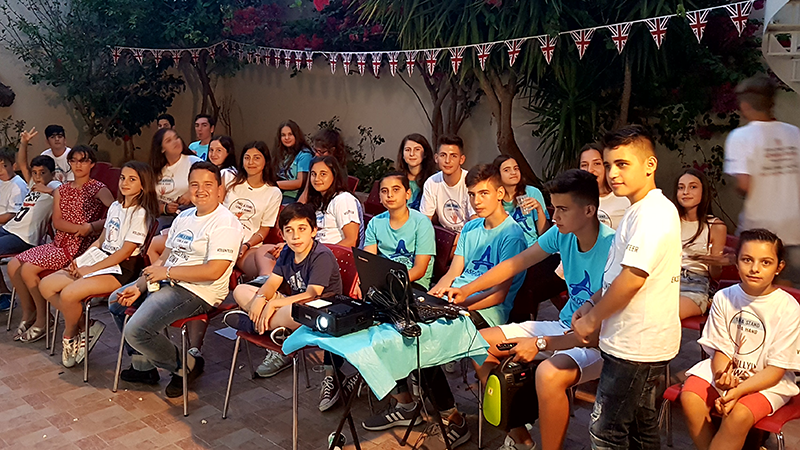 Before leaving us, Nick introduced the night’s screening and our Team went on to enjoy a most memorable outdoor movie night with plenty of pop-corn under a starry Mediterranean sky. We are already looking forward to next year’s Stand Up To Bullying Day as it will coincide with our Anti-Bullying Campaign’s 5th anniversary celebrations!